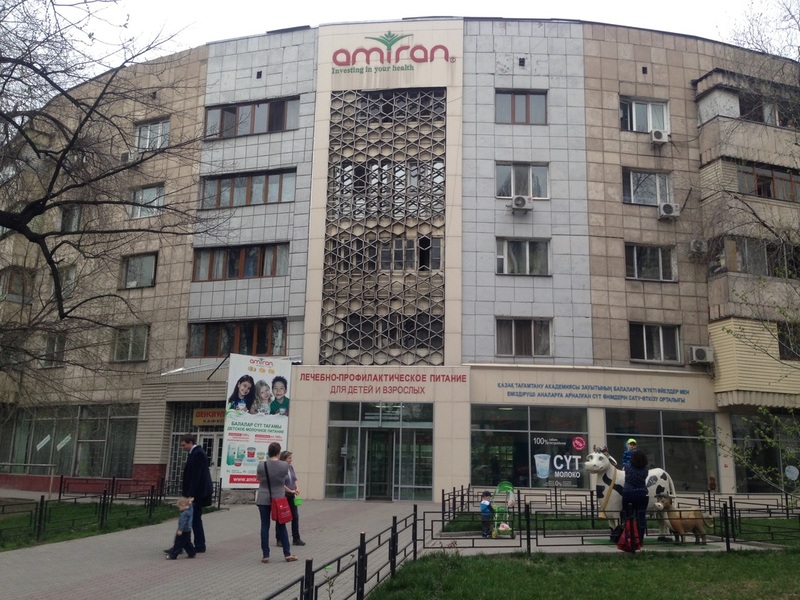 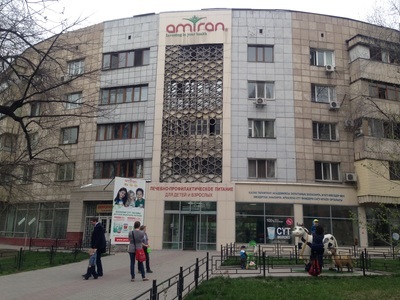 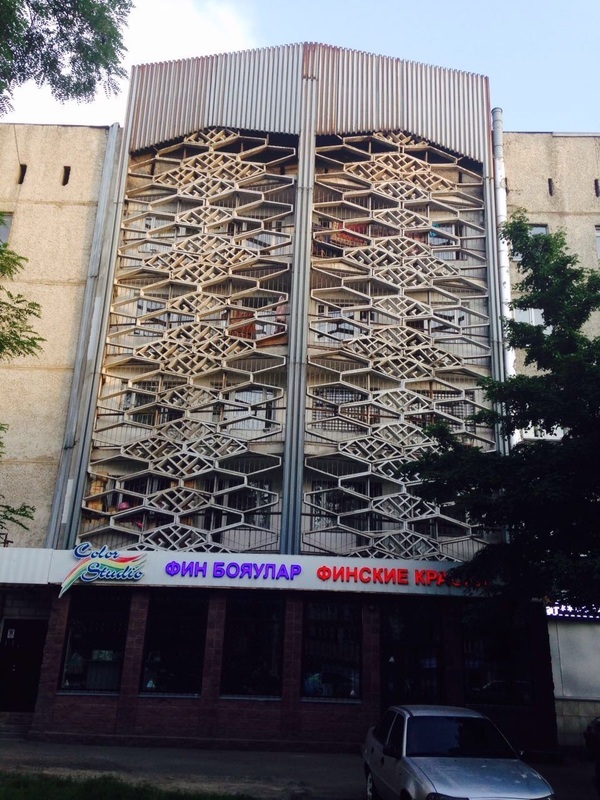 To understand a certain Almaty architectural motif, we'll have to jump through a few different languages, so hold on. 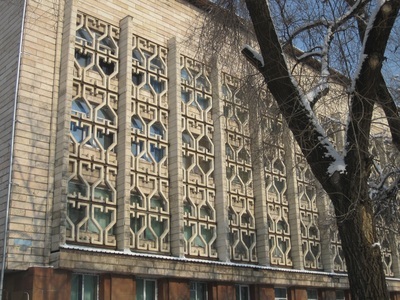 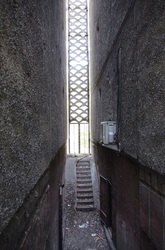 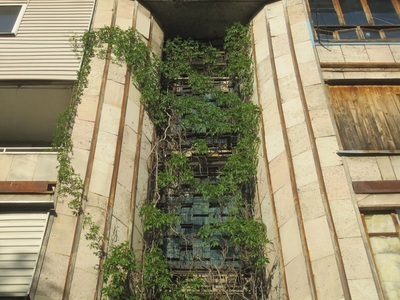 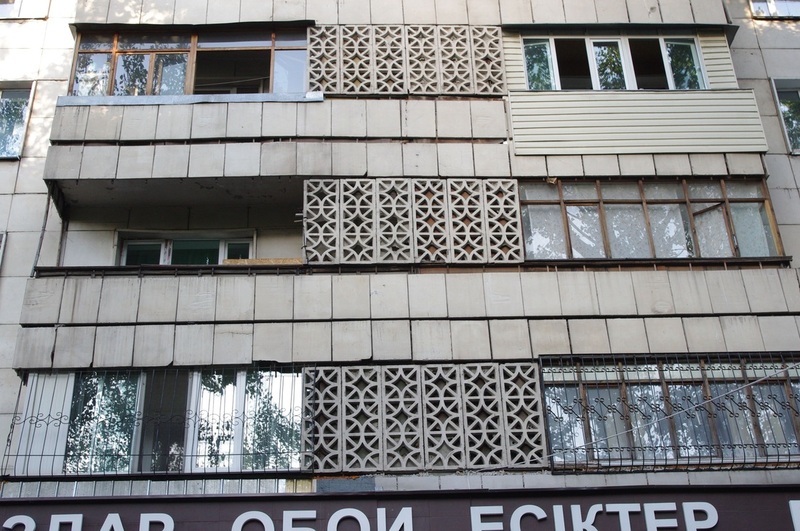 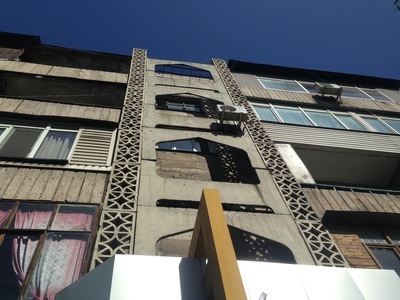 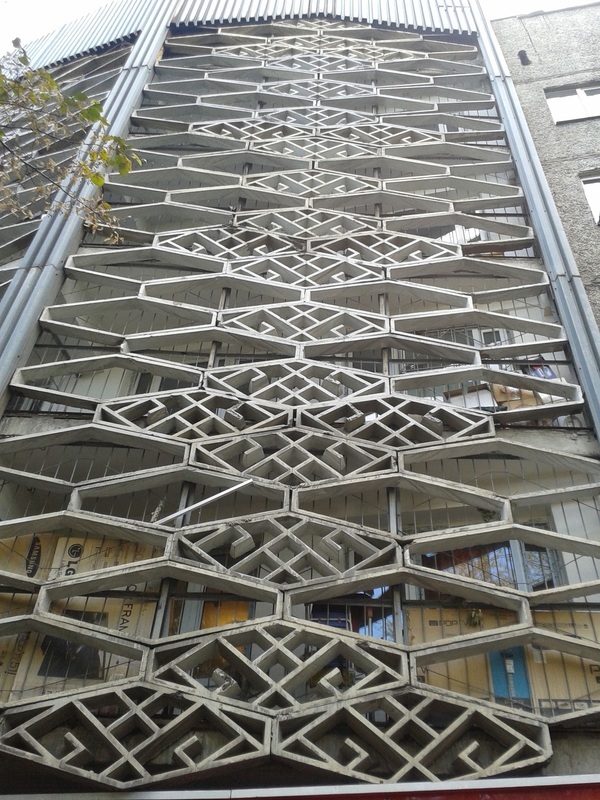 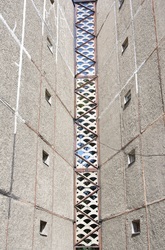 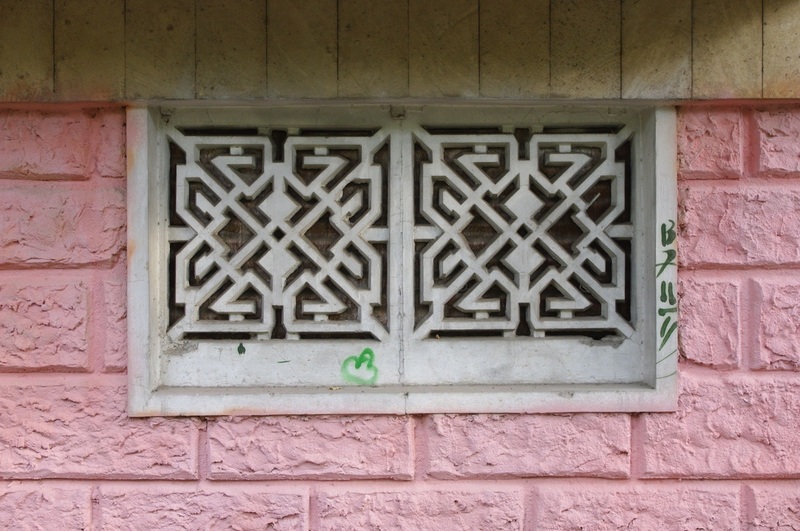 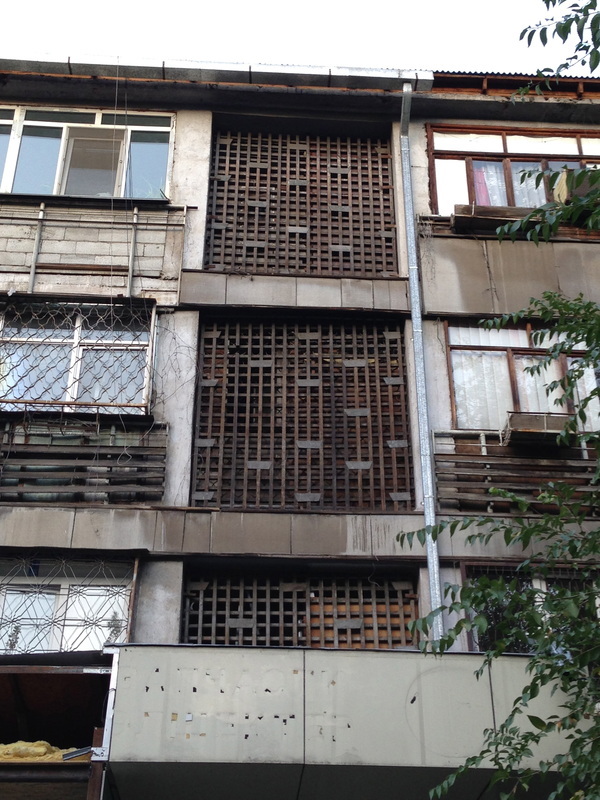 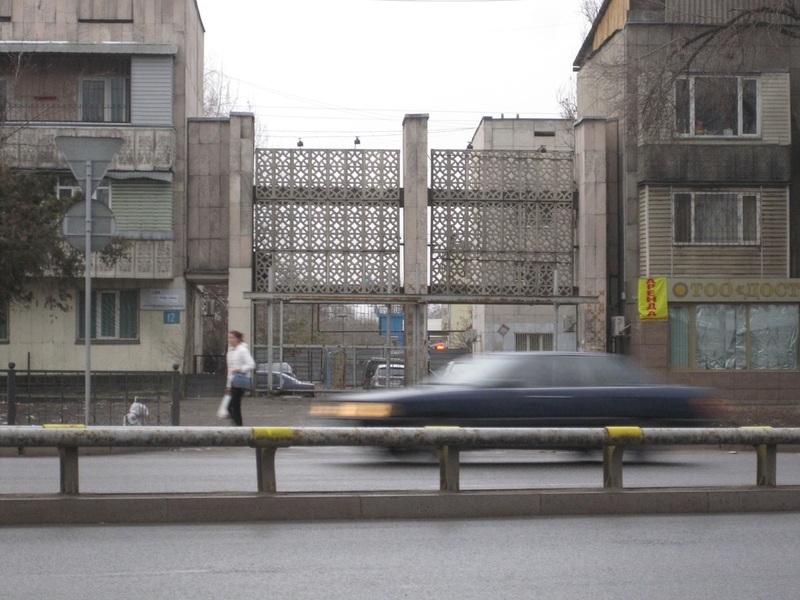 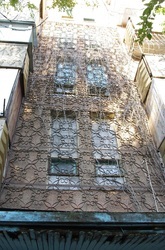 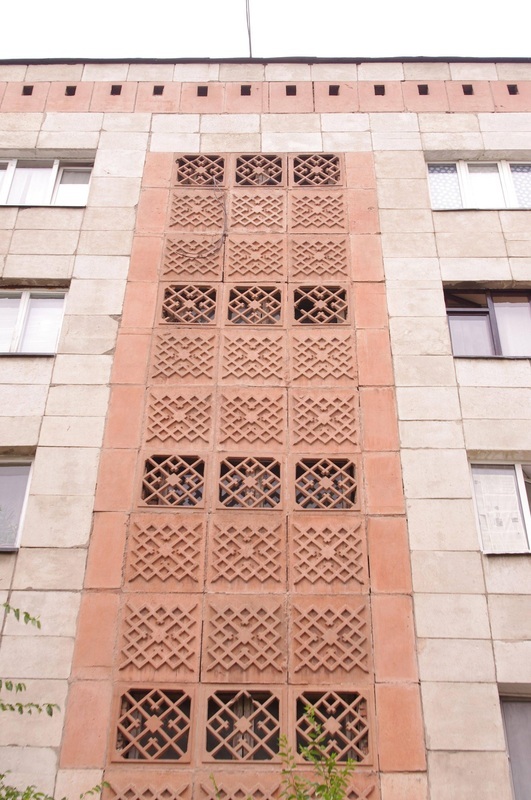 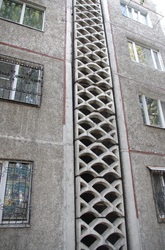 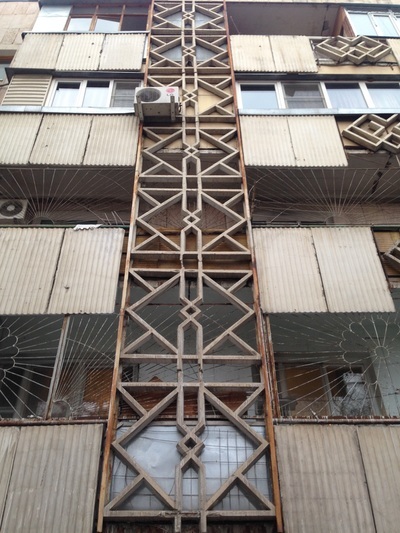 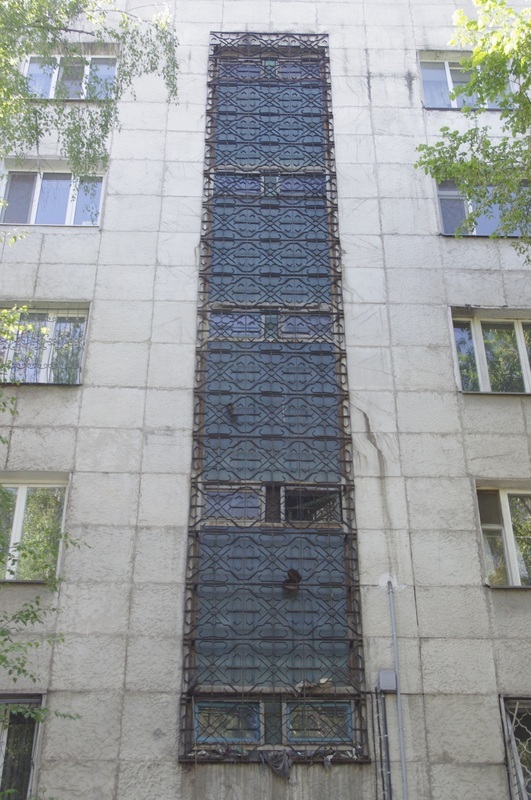 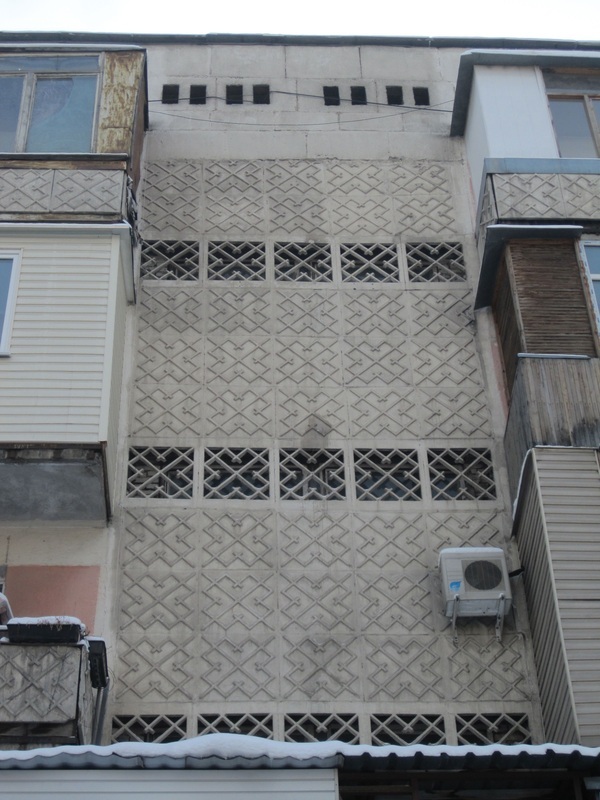 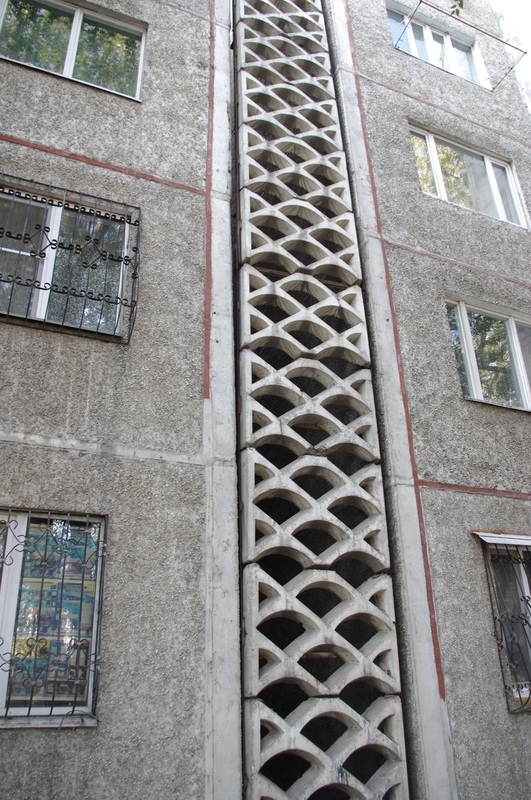 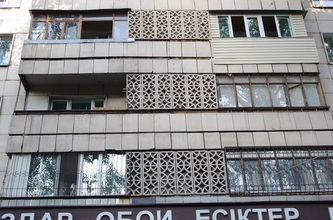 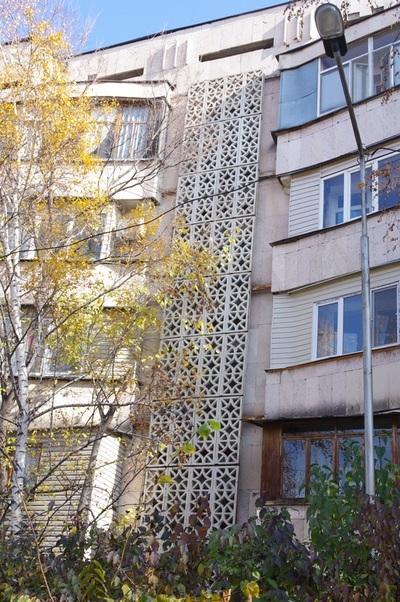 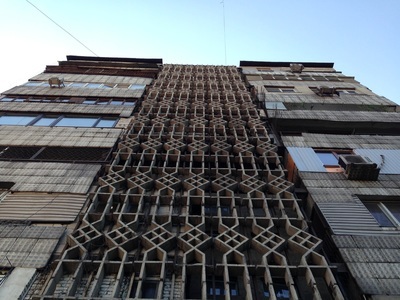 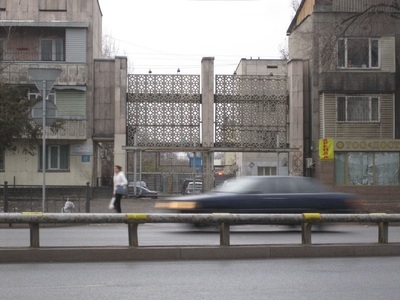 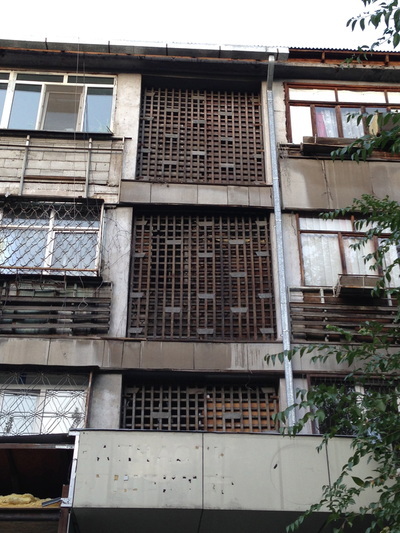 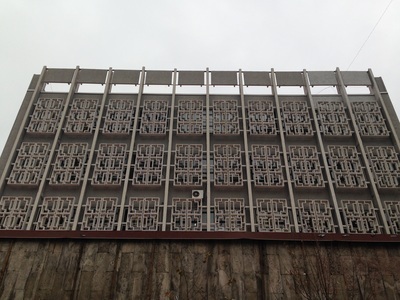 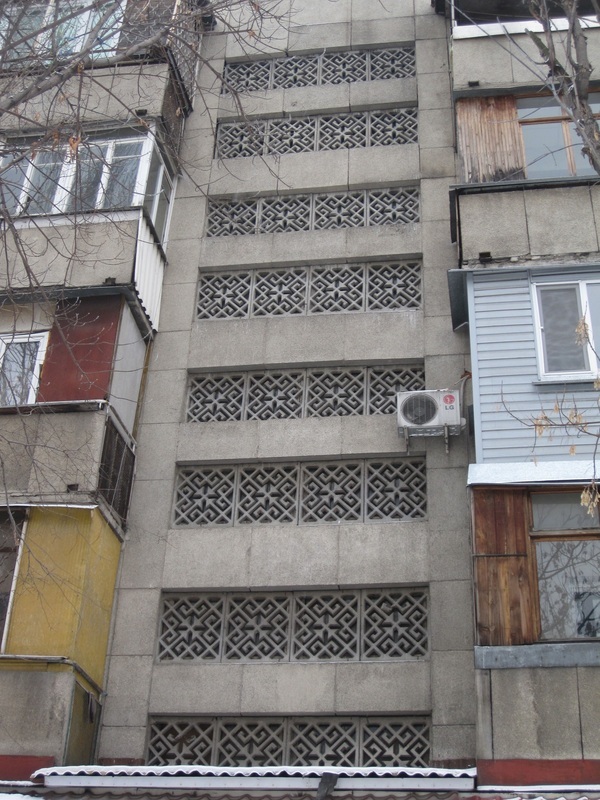 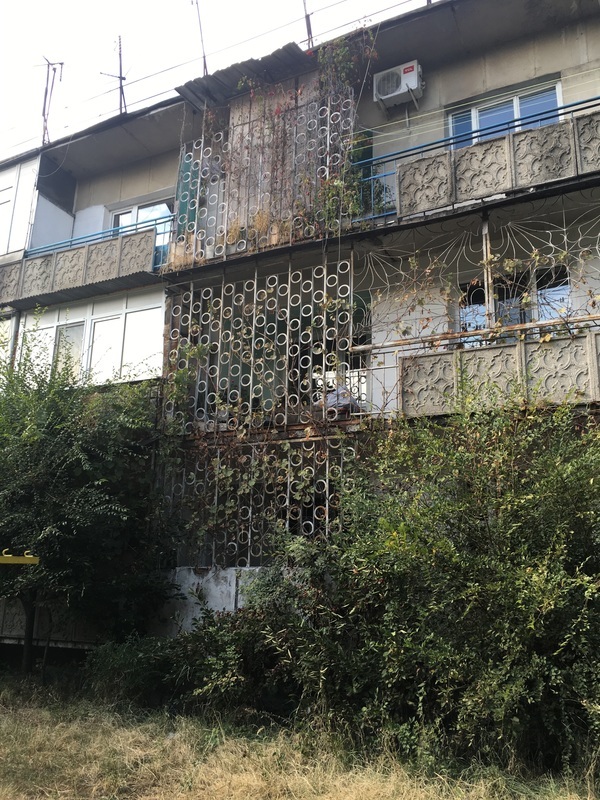 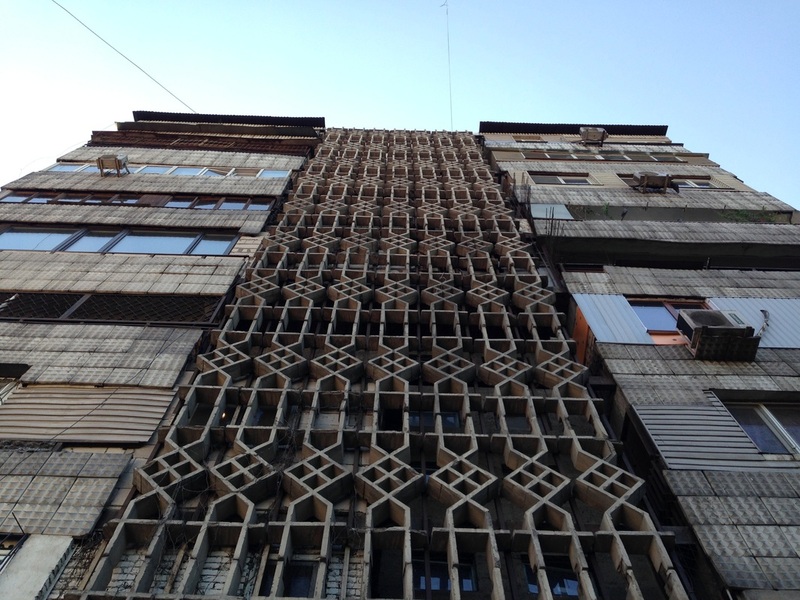 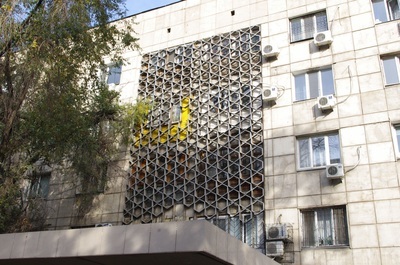 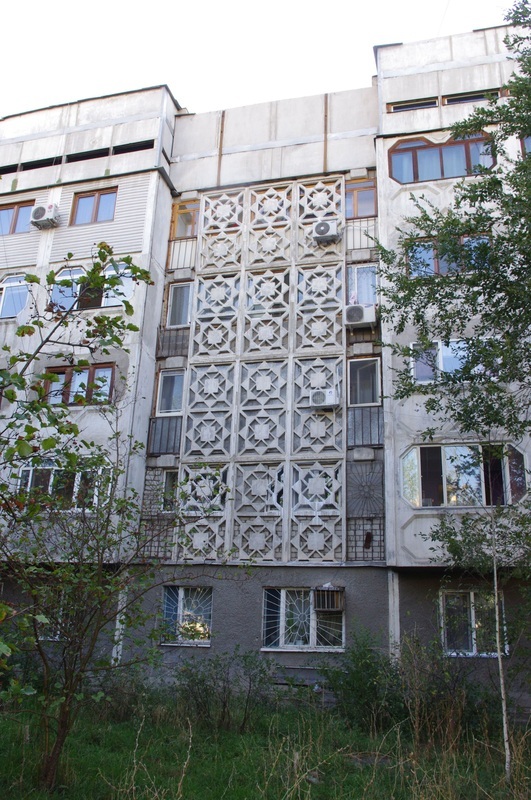 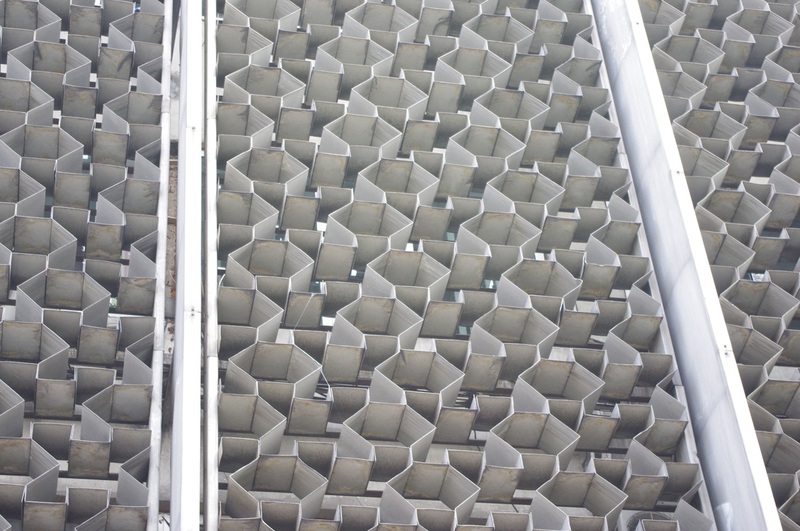 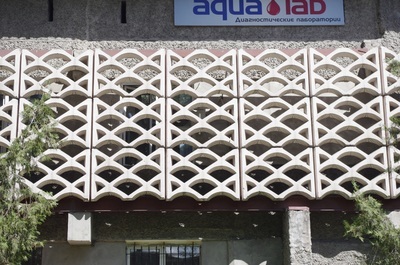 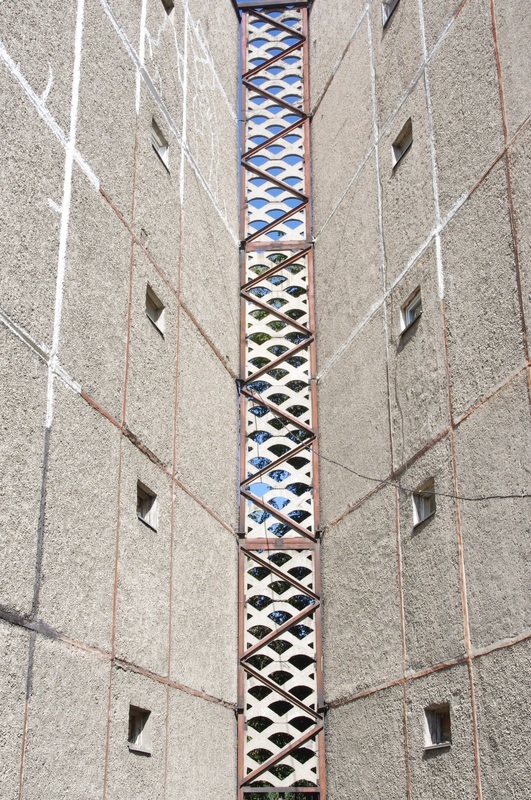 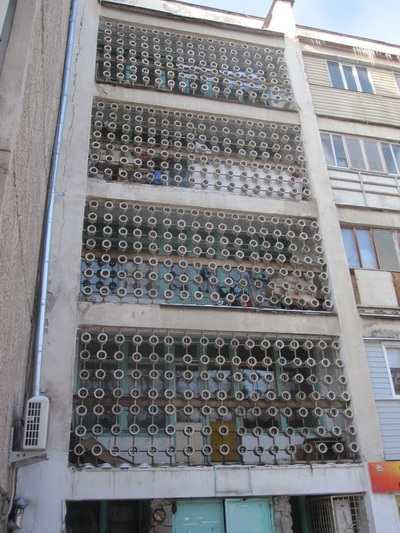 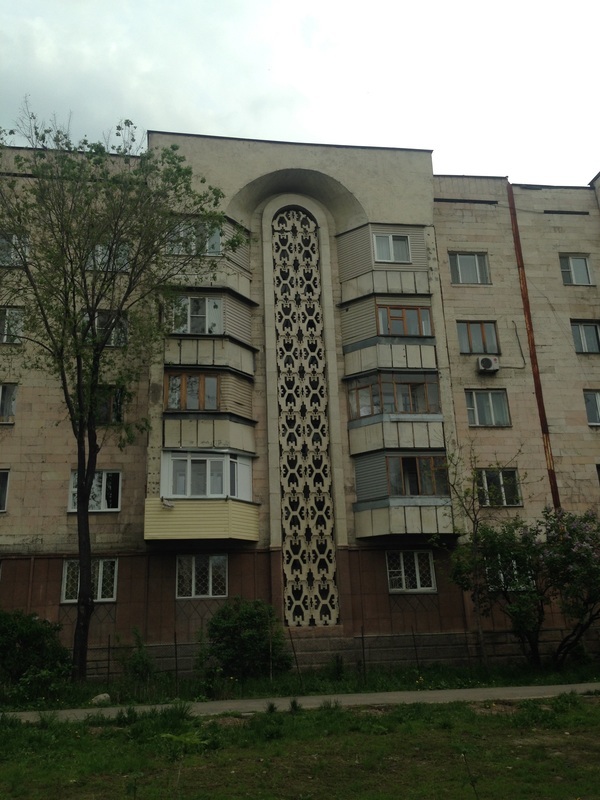 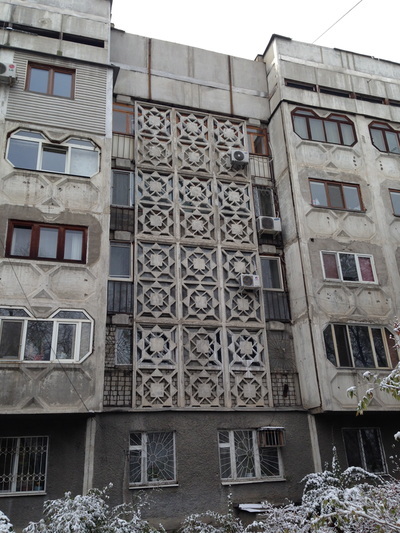 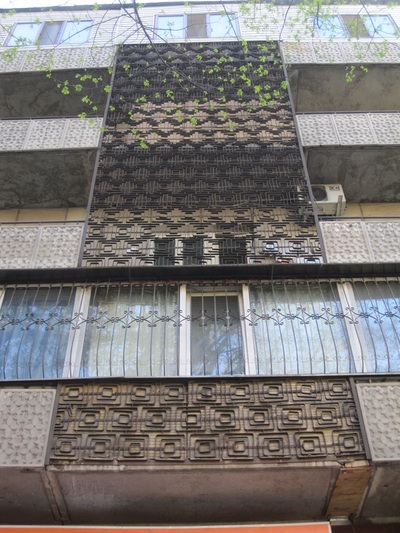 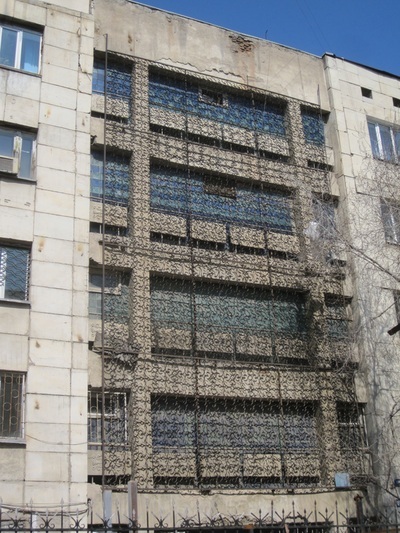 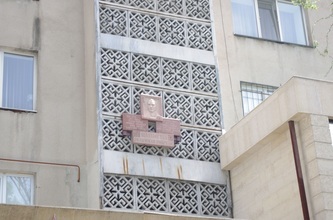 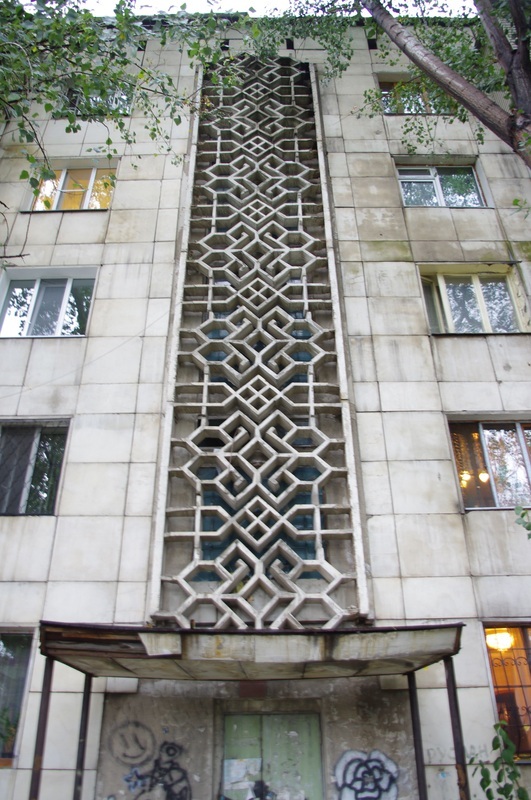 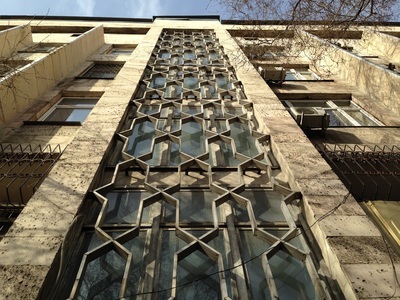 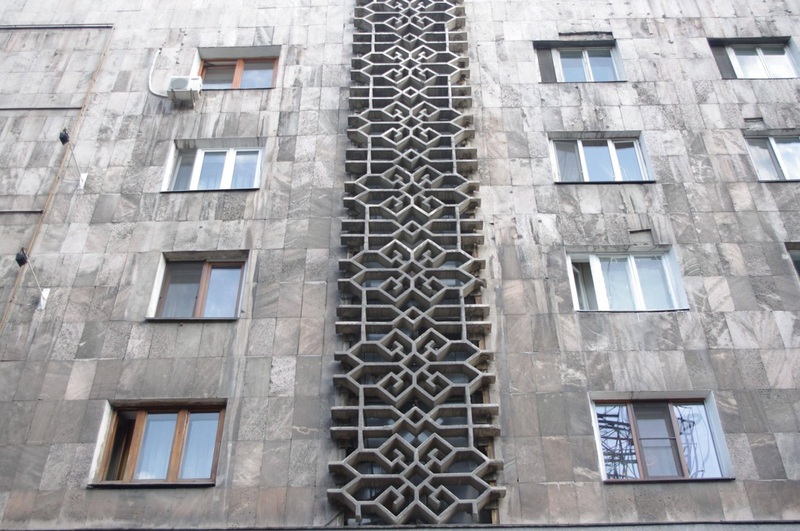 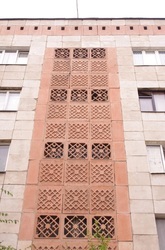 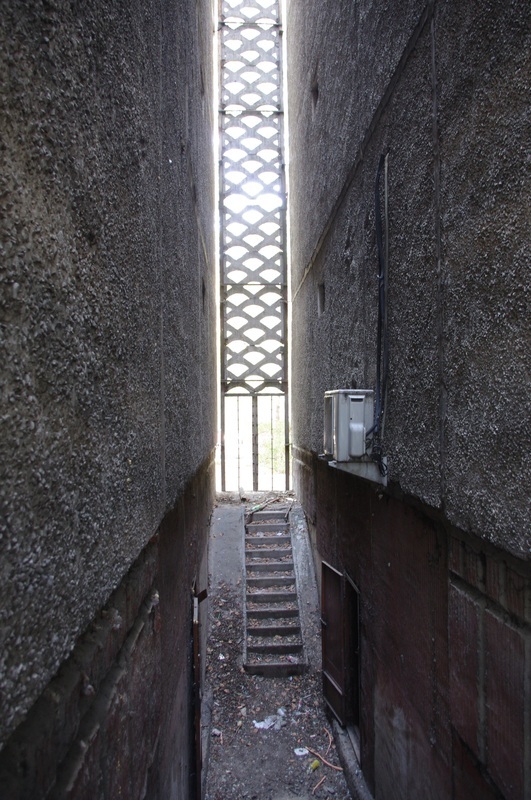 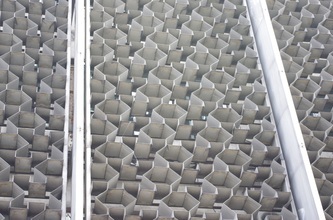 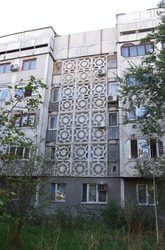 In Russian, the grilles you see here are called solntsezaschitnye reshetki [солнцезащитные решетки], which translates literally as "sunblocking lattice." English, however, has imported a French term to describe these things, brise soleil, which means "sun-breaker." What's going on? 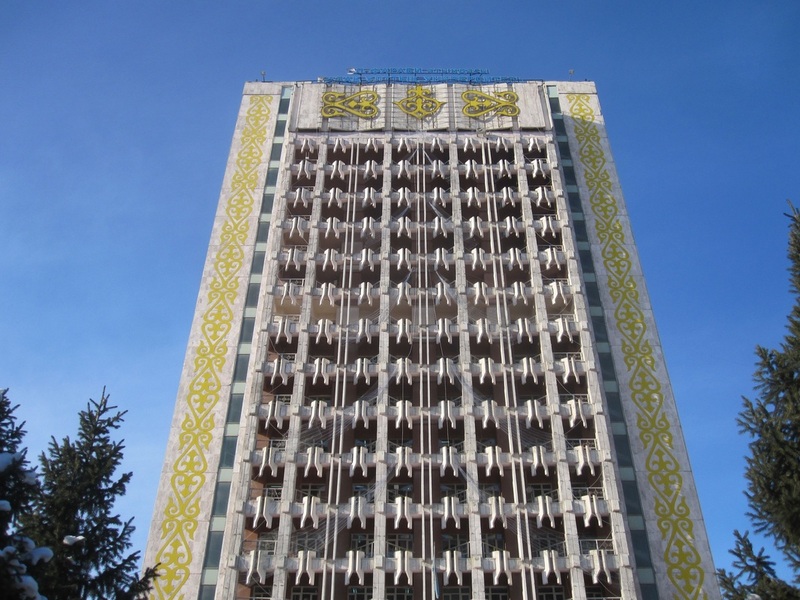 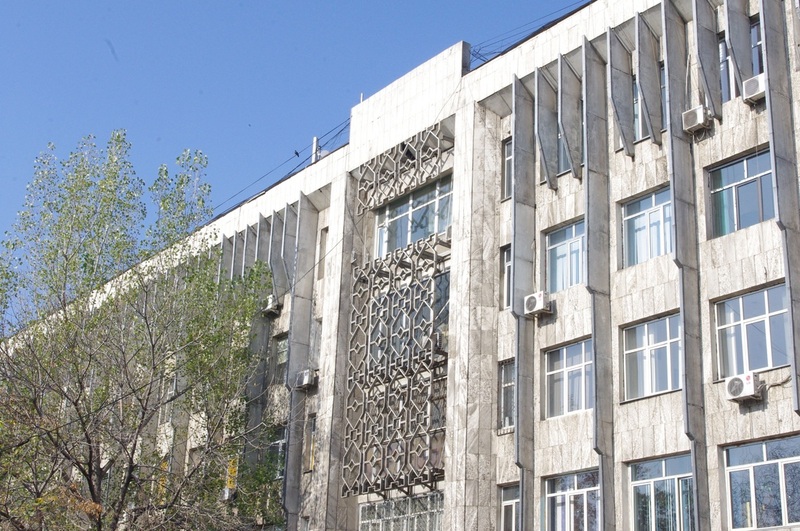 Why do we have French architectural jargon on a site about architecture in Kazakhstan? 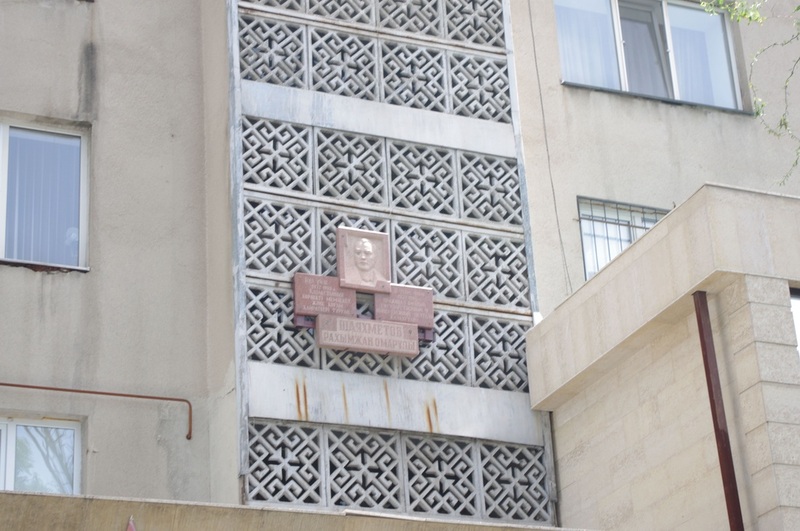 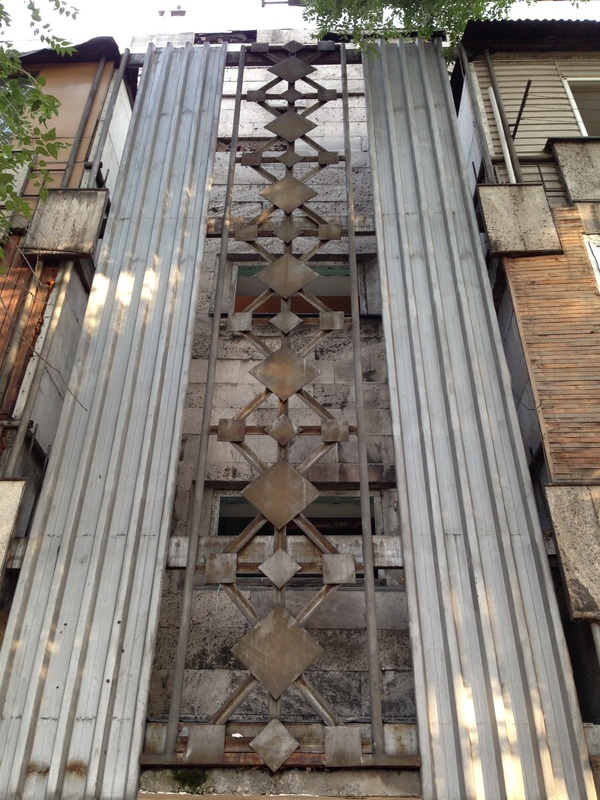 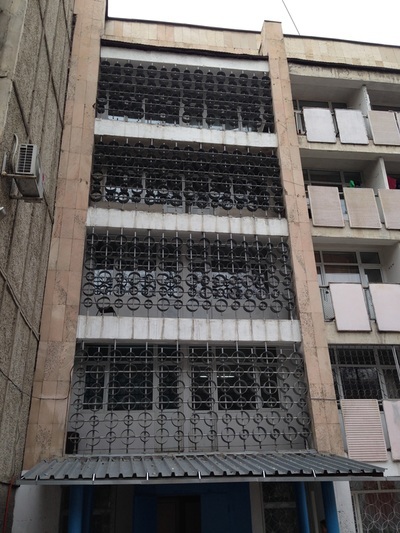 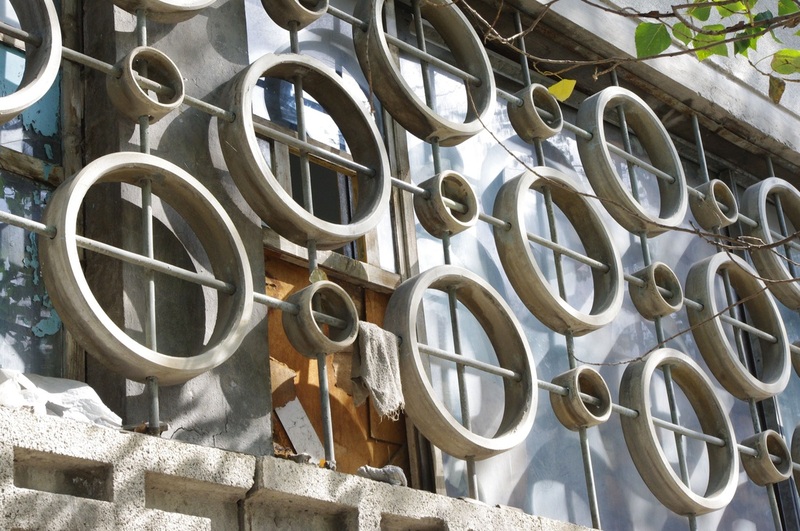 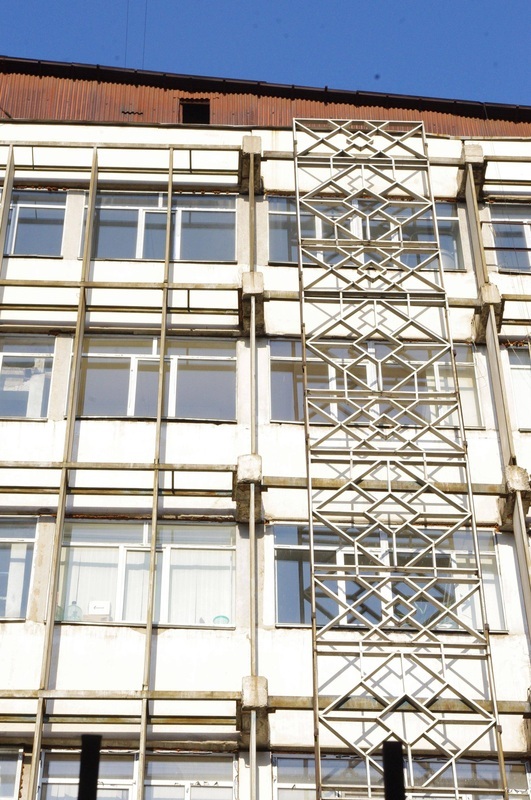 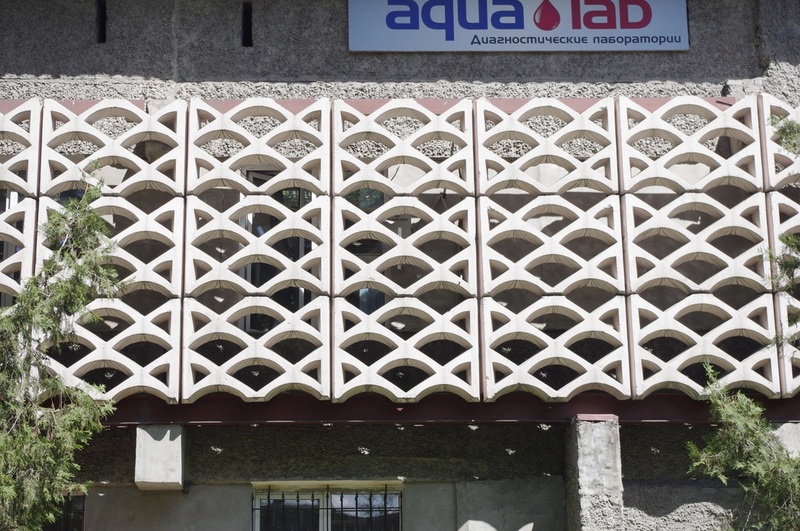 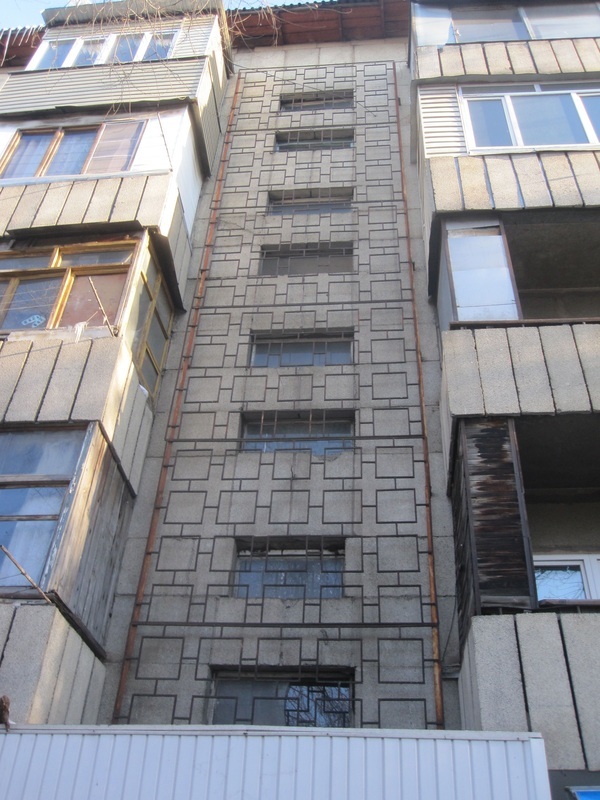 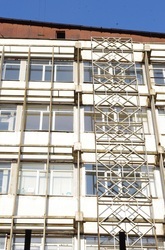 These devices are obsessively employed on Almaty buildings of the '70s and '80s, but it turns out that it was the Swiss-French legend Le Corbusier who first popularized them in the earlier half of the 20th century. 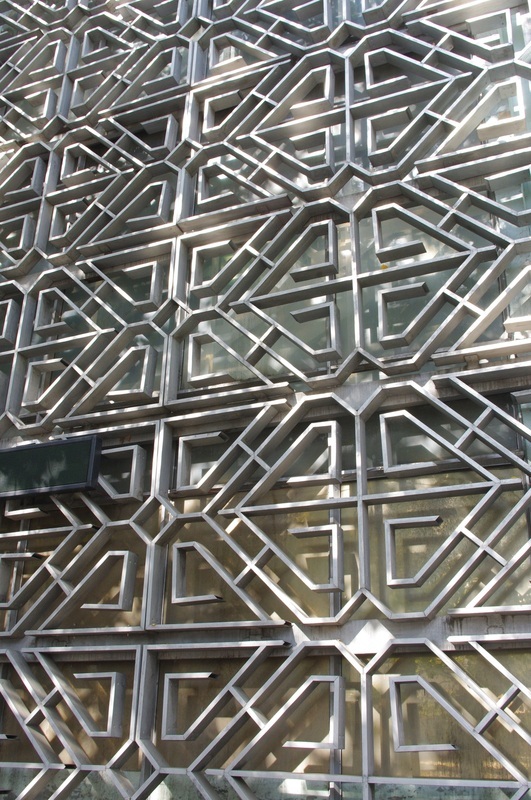 Looking for a way to keep glass cool in the summer, the architect turned to Arab latticework called mashrabiya for inspiration. 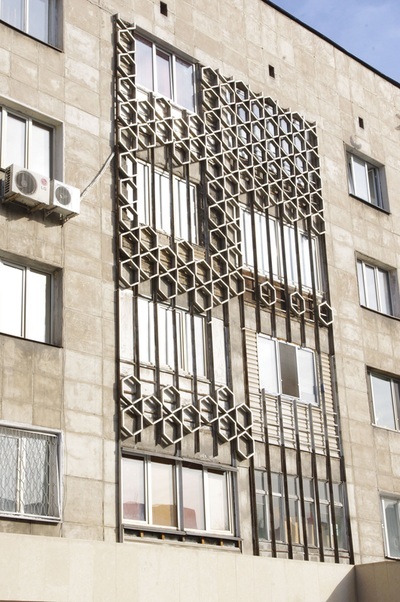 His brise soleil were decidedly less ornate than their Middle Eastern cousins, but they became a common motif in modernist architecture. Considering that Soviet architecture is considered by some to be the apex of modernist design, it's no surprise that Le Corbusier's screens made their way onto the facades of Soviet Kazakhstan's capital. 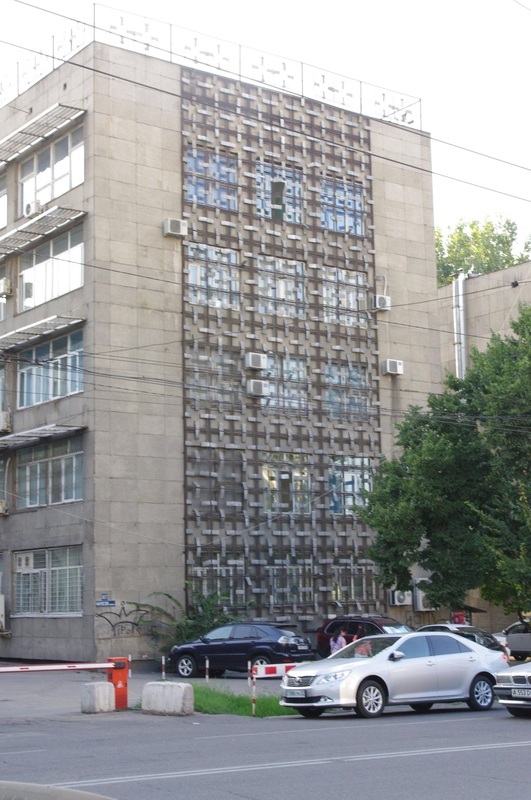 Yet while Le Corbusier's brise soleil were designed with the tropical sun in mind, equatorial temperatures aren't as much a consideration in continental Almaty. Rather, I suspect that the brise soleil were, like balcony panels, a kind of workaround for draughtsmen restricted by the harsh codes of post-Stalin architecture. 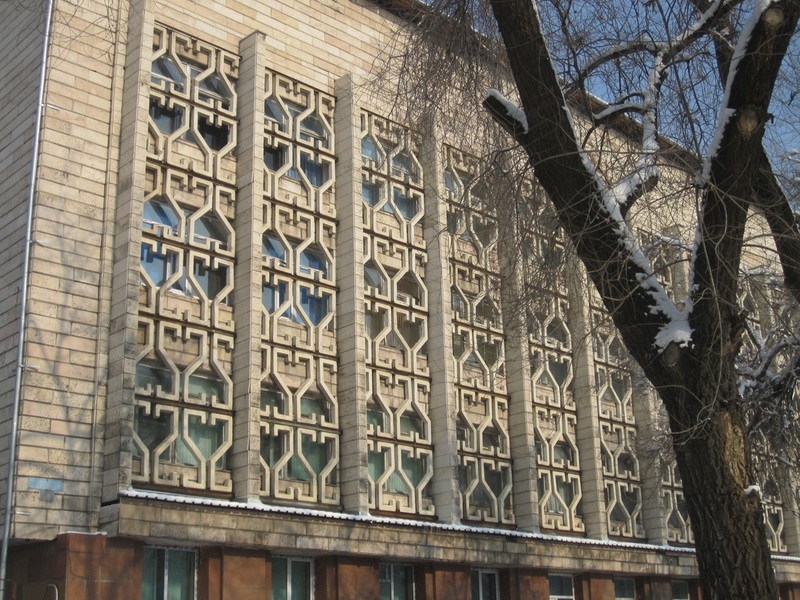 Khruschyovian reforms famously did away with the splendid ornamentation of Stalinist buildings, allowing only the most utilitarian of designs. 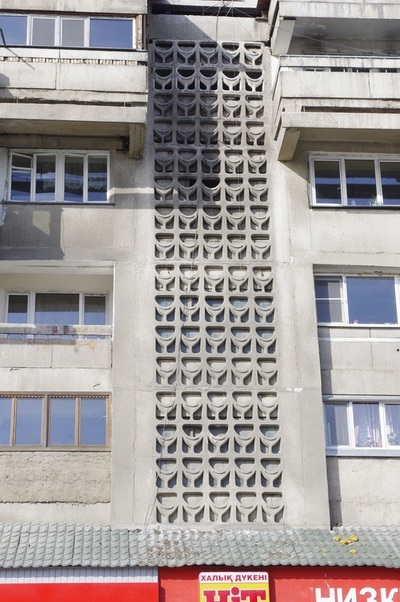 It should have been all concrete boxes from there on out. 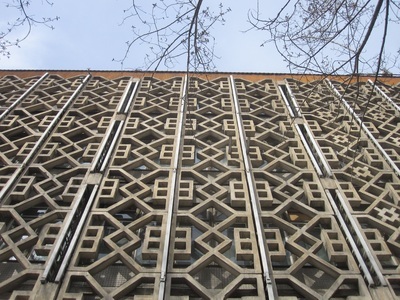 But it was only the buildings' superstructures, with their modular construction, that had to be pared down; brise soleil were a way to add character to buildings that otherwise rejected the notion. 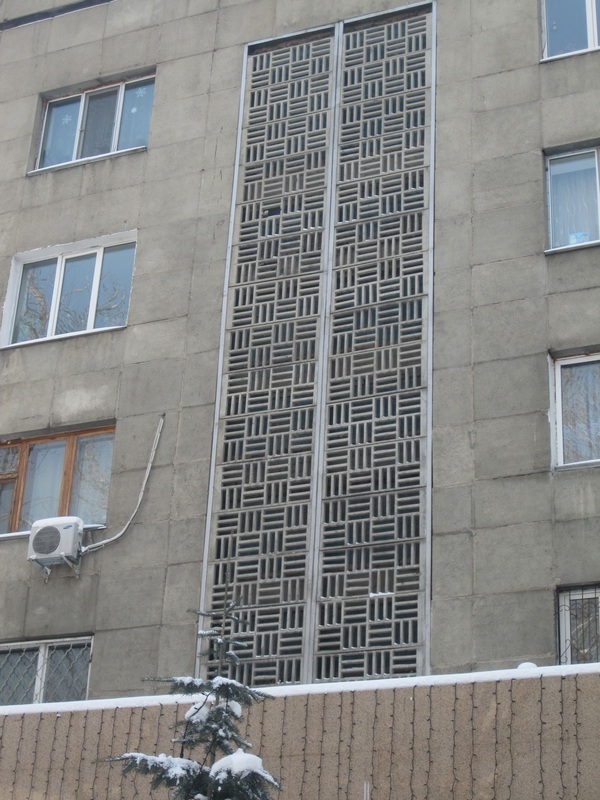 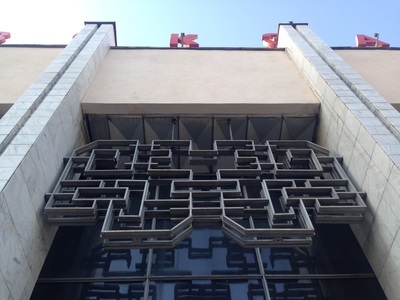 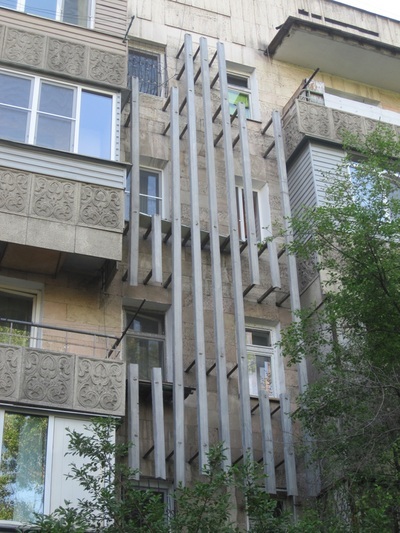 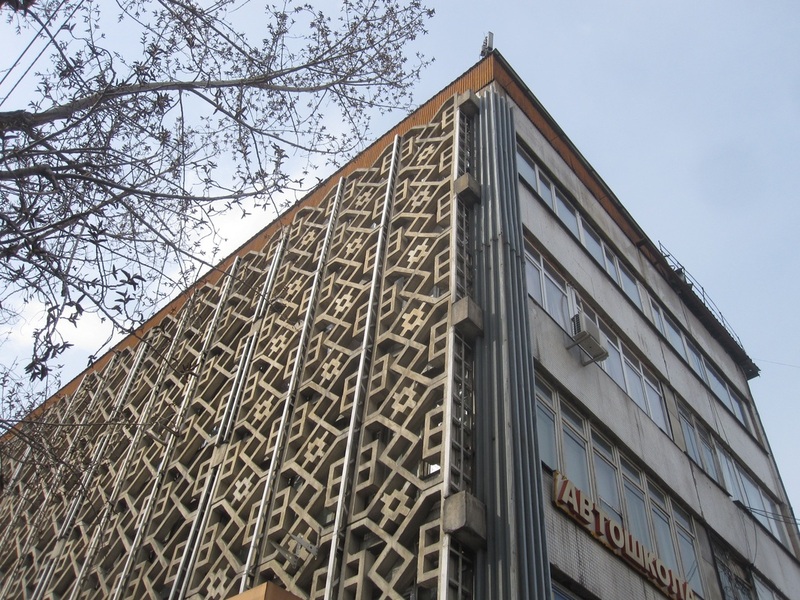 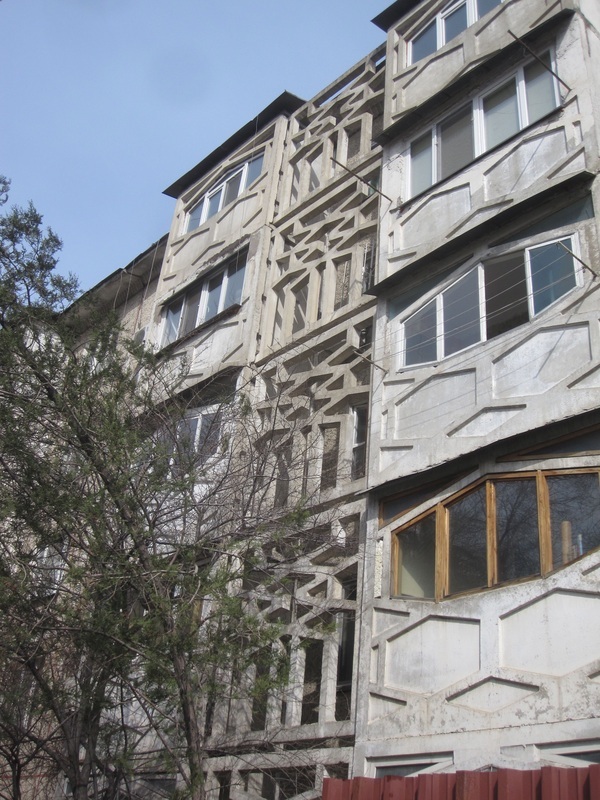 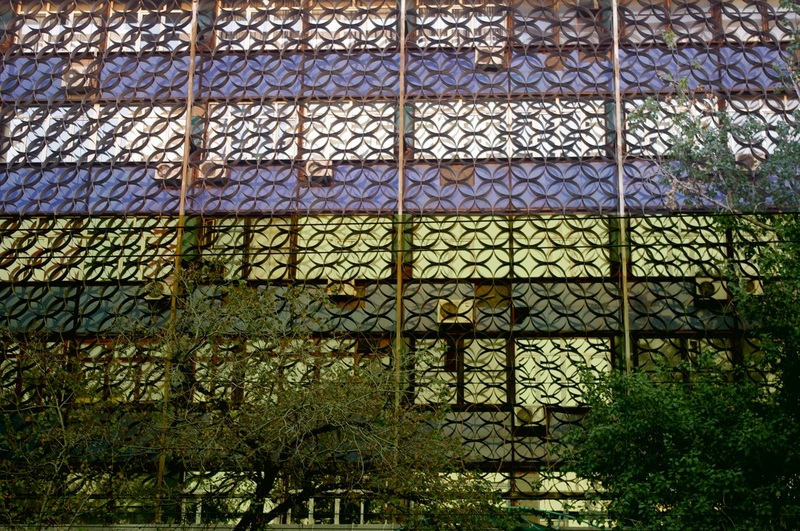 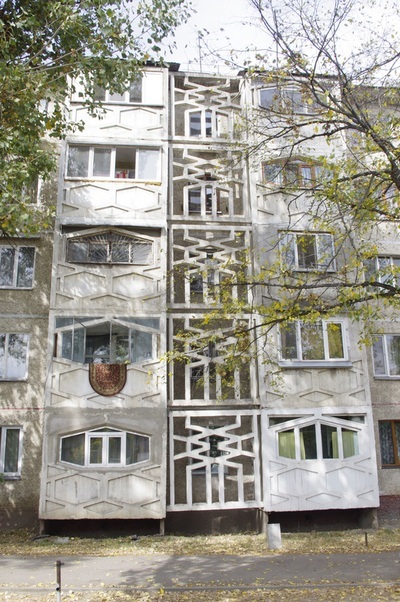 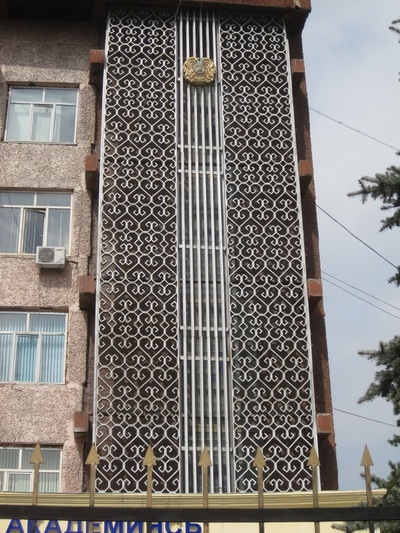 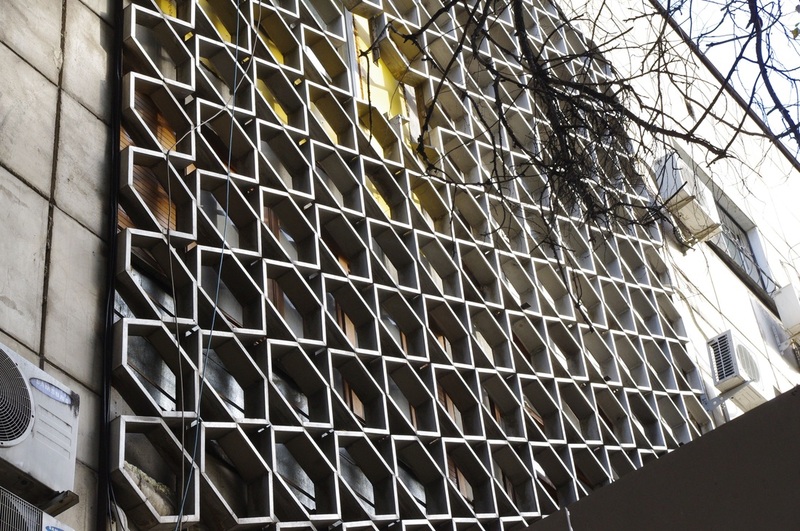 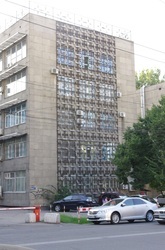 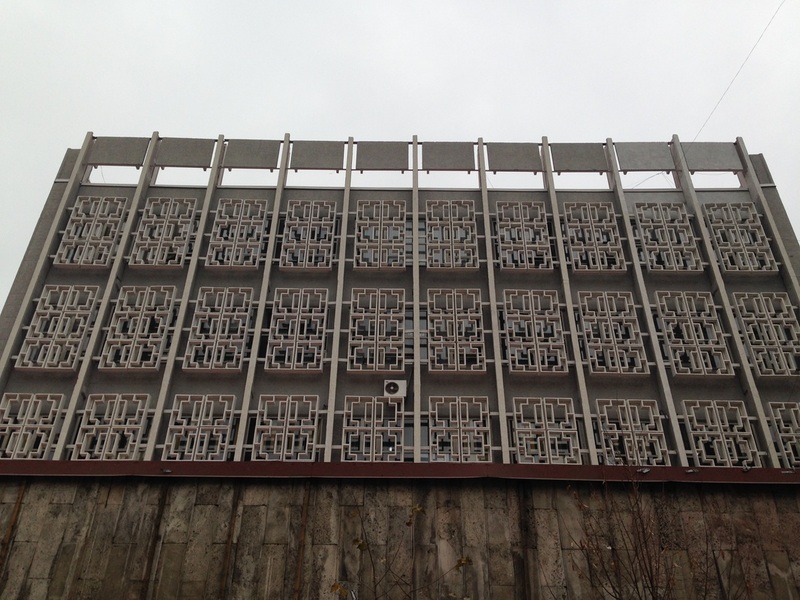 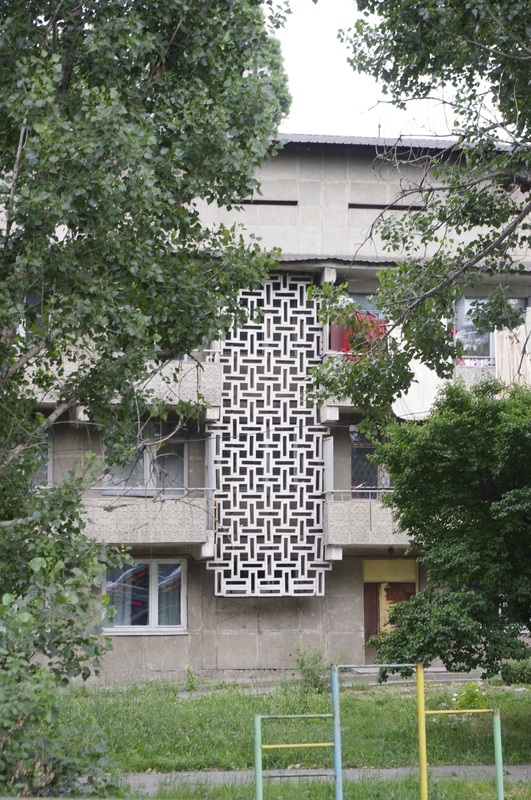 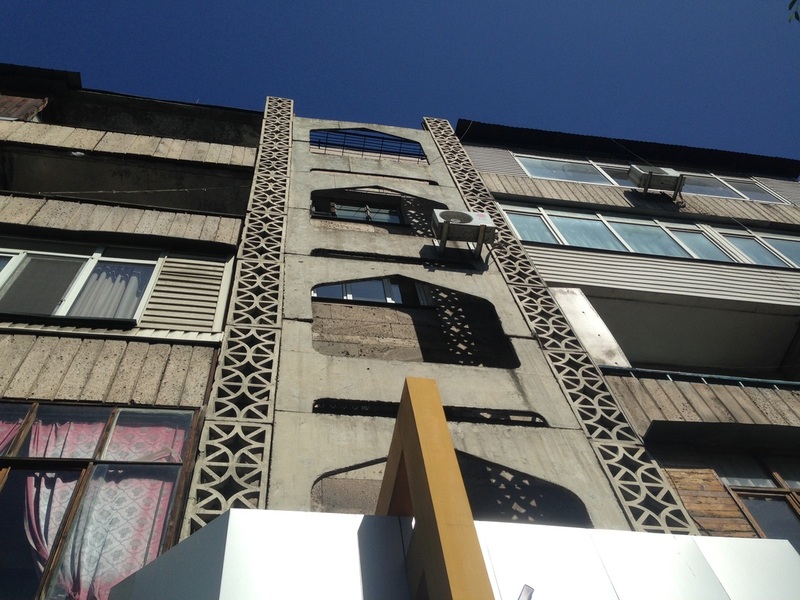 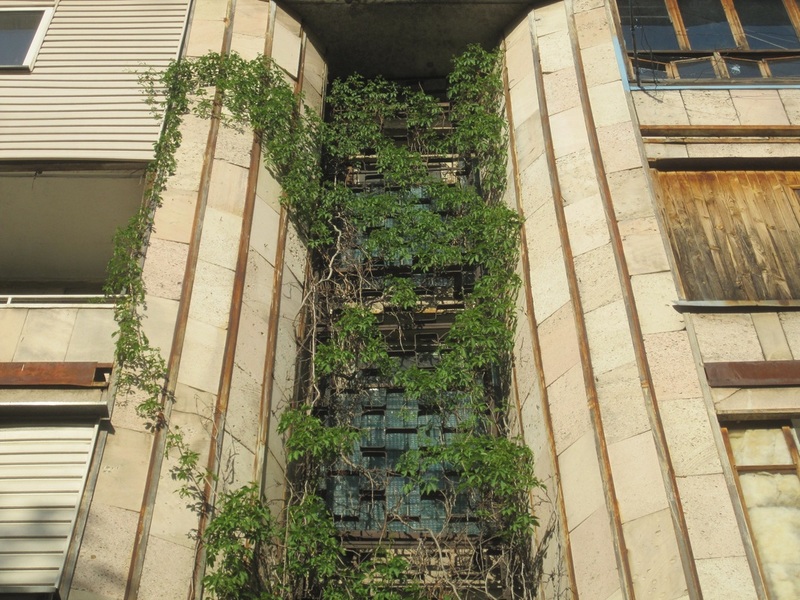 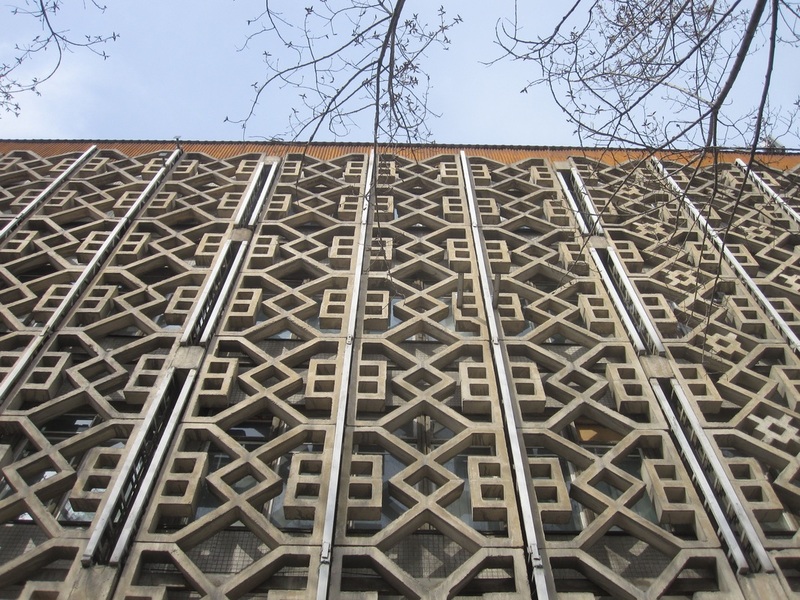 The brise soleil, conveniently, was also a way to add a flavor of Kazakhness to a series of codified buildings that varied little from republic to republic. 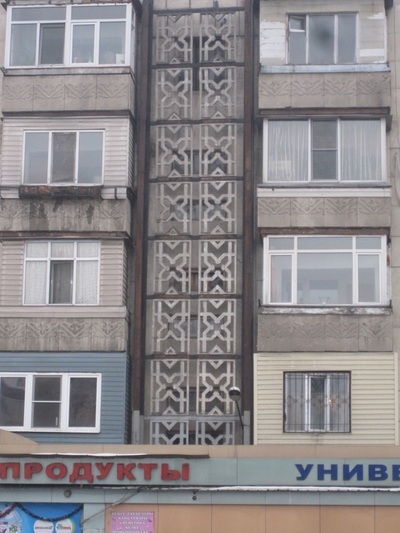 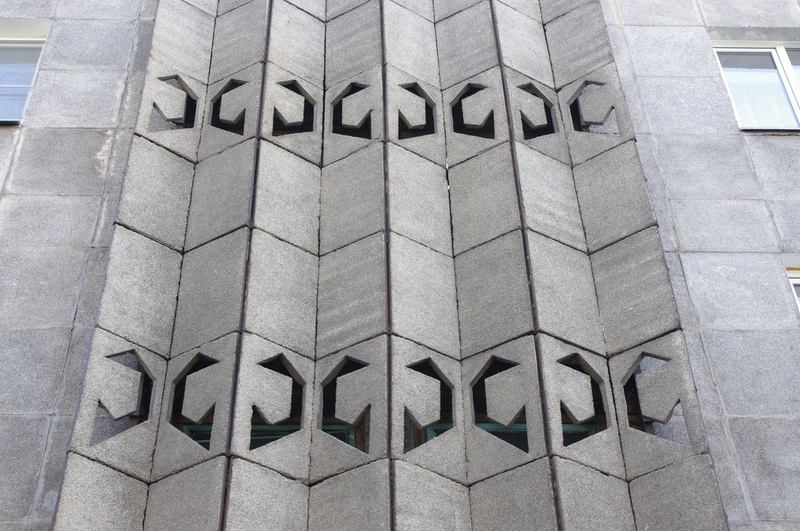 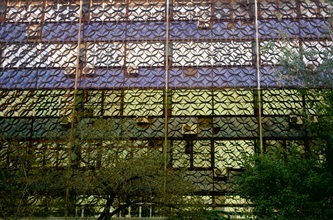 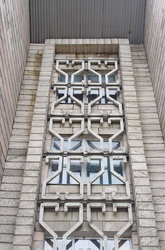 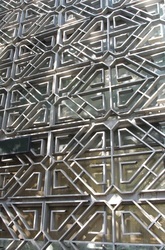 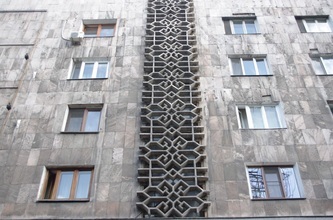 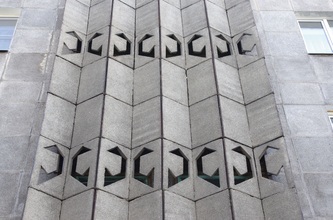 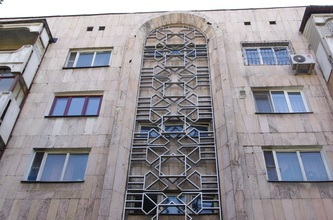 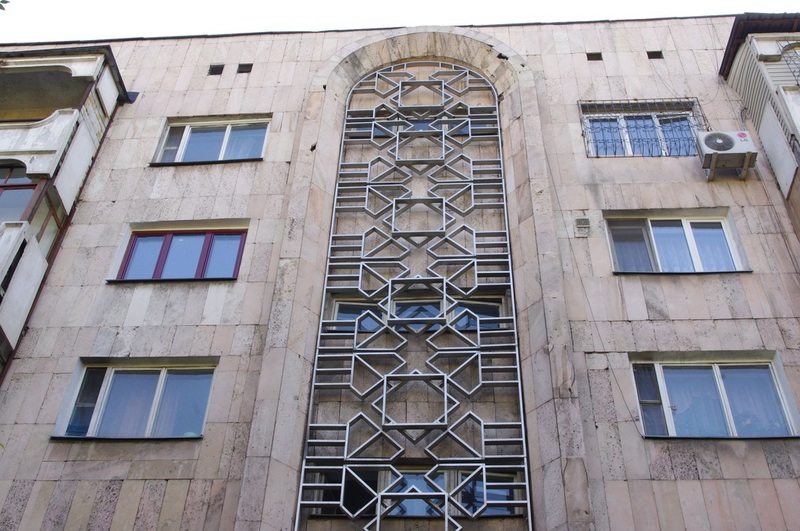 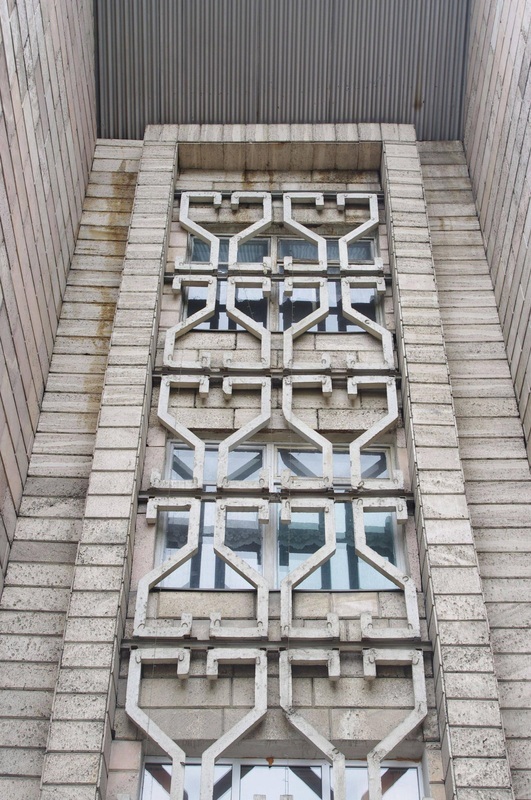 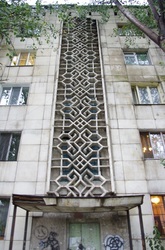 Their designs of these grilles were often inspired by the symmetrical geometry of Kazakh textiles. In Almaty's 20th century "sun-breakers" you can see the ram horns, flower buds, and birds' wings of paganistic symbolism, laid atop a utopian architecture that strove to stand for a supranational identity. 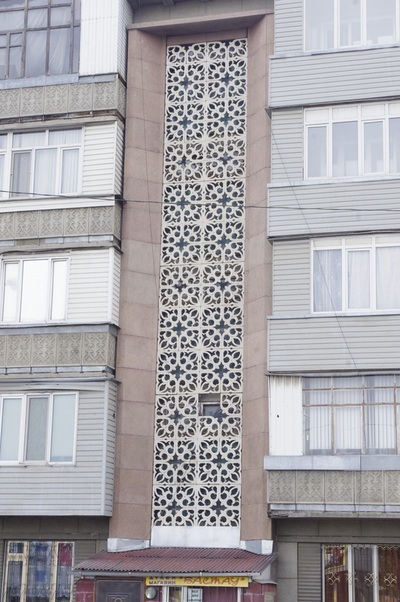 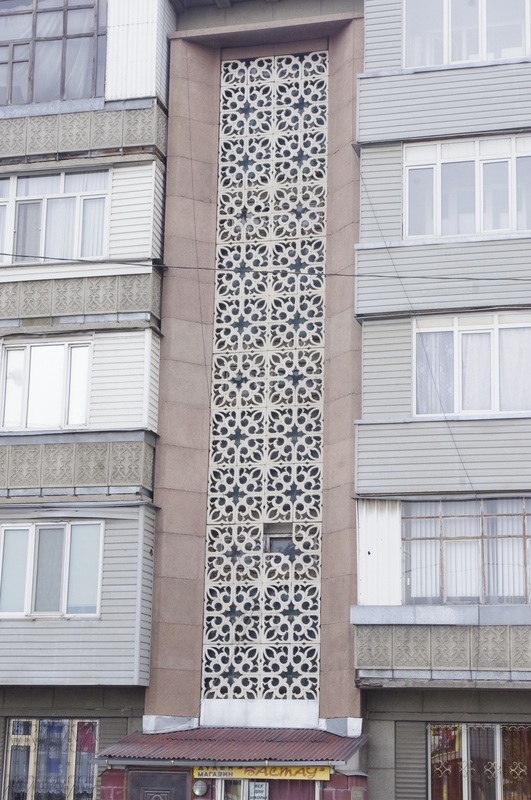 Swiss, Arabic, Kazakh and Uzbek, all rolled up into one modernist motif.